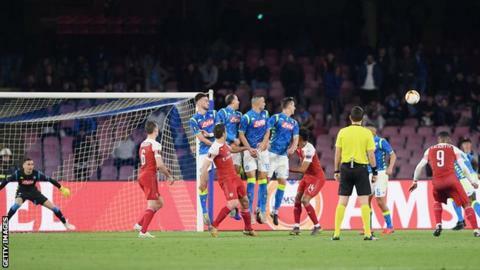 Arsenal keeper Petr Cech says his side made a "very difficult" trip to Napoli "look easy" to seal a 3-0 aggregate win and reach the Europa League last four. Alexandre Lacazette's first-half free-kick into the top corner earned victory on the night after the hosts had had the better of the early chances. "We controlled the game really well and defended really well too," said Cech. The Gunners will host Valencia in the first leg of their semi-final on Thursday, 2 May (20:00 BST kick-off). Cech, who is retiring as a player this summer, saved well from Jose Callejon, while Arkadiusz Milik had a goal ruled out for offside - but otherwise the Serie A side struggled to make an impression. "Napoli are a fantastic team who always score a lot of goals, especially here at home, so to keep two clean sheets is obviously something [positive]," added the 36-year-old Czech. "It was a very difficult game but we made it look easier because we played really well." It ensured a comfortable night's work for the Gunners as Unai Emery marked his 50th game as their manager. Arsenal, who arrived at the Stadio San Paolo with a 2-0 lead from the first leg at Emirates Stadium, could have doubled their margin of victory on the night but home goalkeeper Alex Meret superbly saved from Pierre-Emerick Aubameyang after the break. The only negative aspect of the evening for Arsenal was Aaron Ramsey hobbling off with a suspected hamstring injury. The Wales midfielder was withdrawn in the first half and will be a doubt for the club's remaining fixtures before his summer move to Juventus. When it comes to the Europa League knockout stages, Emery has an unequalled managerial record - 26 wins. And his know-how from winning the tournament three seasons in a row from 2013-14 while manager of La Liga side Sevilla came to the fore in the second leg. While the 2-0 advantage from the first leg gave Arsenal room for manoeuvre, there were few thoughts of simply playing to contain their opponents. Deploying a three-man defence allowed them to initially take the game to their hosts as Ainsley Maitland-Niles and Sead Kolasinac pressed forward and Lucas Torreira and Ramsey controlled proceedings in midfield. Napoli did respond but Lacazette's goal signalled the end of the home pressure and settled any lingering Arsenal nerves. It left Carlo Ancelotti's side needing to score four times and maintained the Gunners' record of scoring early on their travels - 16 of their past 18 away goals have been in the first half. With the cushion of their away goal, Arsenal deployed men behind the ball in the second period, allowing Napoli possession but few chances - with Lorenzo Insigne's tame effort the hosts' only shot on target. While Emery was winning the first of his three Europa League crowns, Carlo Ancelotti was guiding Real Madrid to Champions League success. But after this defeat, the Italian will have to put thoughts of becoming only the seventh manager to win both of European football's major club competitions to the back of his mind. Only Udo Lattek, Bob Paisley, Giovanni Trapattoni, Louis van Gaal, Jose Mourinho and Rafael Benitez had accomplished that feat previously and while Ancelotti's side embraced his instructions to play with "intensity and heart", there was an absence of quality from their performance. At times, they barely resembled the side with the swagger of Serie A's third-highest scorers, behind Juventus and Atalanta. Callejon missed a golden opportunity to score the game's opening goal - firing straight at Cech after a surging forward run from Senegal defender Kalidou Koulibaly. Poland forward Milik was also wasteful in front of goal, failing to register an effort on target despite being presented with two free headers in front of the Arsenal goal that should have brought more. And it ensured their Europa League campaign ended in an underwhelming fashion. Arsenal boss Unai Emery, speaking to BT Sport: "I am proud of the players. We started very well. The first half was good because after we scored we continued not to give them opportunities. We defended well in the second half. In the two matches, we can be happy to win against Napoli." On semi-final opponents Valencia: "They are a very good team with good players. It will be a difficult match for us." Asked if Ramsey has played his last game for Arsenal: "I don't know." Napoli manager Carlo Ancelotti, speaking to BT Sport: "I think that we are not happy of course but in the two games where we didn't too well was the first 20 minutes in the first game. "We tried today. The first goal made it almost impossible. We needed to score four goals and lost confidence. We needed to score quickly. We had two opportunities. "Arsenal are a good team, so it was difficult but we have to look forward. Until the Arsenal goal we did a good game." Arsenal have kept nine clean sheets in their past 11 European games, conceding just four goals in that period. Napoli have gone out of two European competitions this season after defeats by Premier League clubs - they exited the Champions League at the group stage after losing 1-0 at Liverpool in December. The Italian side have lost three consecutive European games for the first time since February 2013. No Premier League side has scored more goals via direct free-kicks in all competitions this season than Arsenal (four, level with Chelsea). Arsenal posted a 30.3% possession figure against Napoli, their lowest such figure in any competition since February 2017 (25.7% v Bayern Munich in the Champions League). Unai Emery has now won 26 matches in the Europa League knockout stages - more than any other manager. Since his debut for Arsenal in August 2017, Alexandre Lacazette has had a hand in 46 goals in all competitions (33 goals, 13 assists), more than any other player for the club. Lacazette is the first Arsenal player to score in Europe with a direct free-kick since Thierry Henry against Roma in 2002-03. Arsenal host Crystal Palace in the Premier League on Sunday 21 April (16:00 BST). Match ends, Napoli 0, Arsenal 1. Second Half ends, Napoli 0, Arsenal 1. Attempt missed. Fabián Ruiz (Napoli) left footed shot from the right side of the box is too high. Assisted by Mário Rui with a cross. Attempt missed. Henrikh Mkhitaryan (Arsenal) right footed shot from a difficult angle and long range on the left is too high from a direct free kick. José Callejón (Napoli) is shown the yellow card for a bad foul. Corner, Arsenal. Conceded by Allan. Corner, Arsenal. Conceded by Vlad Chiriches. Attempt missed. Kalidou Koulibaly (Napoli) header from the centre of the box misses to the left. Assisted by Fabián Ruiz with a cross following a corner. Offside, Arsenal. Pierre-Emerick Aubameyang tries a through ball, but Alex Iwobi is caught offside. Attempt blocked. Kalidou Koulibaly (Napoli) header from the centre of the box is blocked. Assisted by Fabián Ruiz with a cross. Corner, Napoli. Conceded by Lucas Torreira. Attempt missed. Piotr Zielinski (Napoli) left footed shot from outside the box misses to the right. Assisted by José Callejón. Petr Cech (Arsenal) is shown the yellow card. Attempt missed. Arkadiusz Milik (Napoli) left footed shot from outside the box is high and wide to the left. Assisted by Fabián Ruiz. Substitution, Napoli. Mário Rui replaces Faouzi Ghoulam. Attempt missed. José Callejón (Napoli) right footed shot from the right side of the box is high and wide to the right. Assisted by Fabián Ruiz following a corner. Attempt blocked. Arkadiusz Milik (Napoli) left footed shot from the centre of the box is blocked. Assisted by Faouzi Ghoulam. Attempt missed. Faouzi Ghoulam (Napoli) left footed shot from the left side of the box misses to the right. Attempt missed. Vlad Chiriches (Napoli) header from the centre of the box is close, but misses to the left. Assisted by Dries Mertens with a cross following a corner. Substitution, Arsenal. Mohamed Elneny replaces Granit Xhaka. Attempt saved. Lorenzo Insigne (Napoli) right footed shot from the left side of the box is saved in the centre of the goal. Assisted by Piotr Zielinski with a through ball. Attempt saved. Pierre-Emerick Aubameyang (Arsenal) right footed shot from a difficult angle on the right is saved in the bottom right corner. Assisted by Lucas Torreira with a cross.